But in retracing parts of the route by car this summer, Julie Pendray was pop-culturally in the dark. Pendray — who worked at KFMB-TV, The San Diego Union-Tribune and KOWN Radio over 32 years in the county — didn’t need the survivalist’s memoir to spark her curiosity. She met a dozen hikers while hosting and helping them in Idyllwild, the trail town in the Riverside County mountains she’s called home for three years. 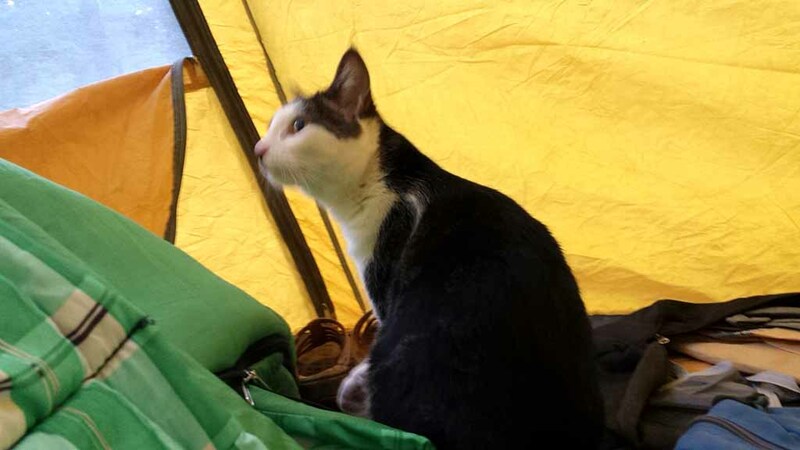 Like the trail-walkers, Pendray is a veteran of roughing it. 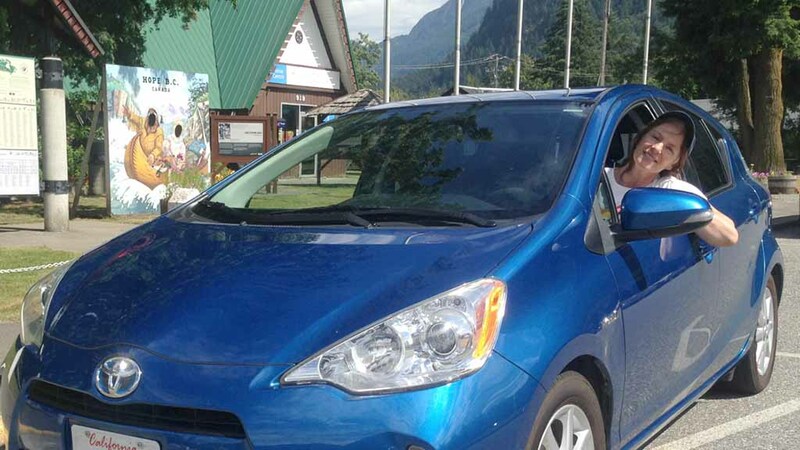 In a 6,000-mile journey beginning June 10, she carried virtually no money. The New Zealand native (she became a U.S. citizen 20 years ago) interviewed and photographed hikers for her website and a planned book. She says a young male Idyllwild musician told her: “This is the kind of trip people do when they’re college age. Your story is so empowering.” Pendray is 58. Along for the ride was her 4-year-old cat Michelle, adopted in Sonoma Valley wine country and boasting her own Facebook page, with nearly 140 followers. “Highly curious and smart as a whip,” Michelle “made a wonderfully soothing and humorous companion, even though having her added another layer of worry in terms of heat and worrying about her getting out and running away,” Pendray said. They entered Canada on July 5 and arrived back in Idyllwild on Aug. 21 — just in time for Jazz in the Pines. At the Union-Tribune, Pendray had the title of North Community news editor. 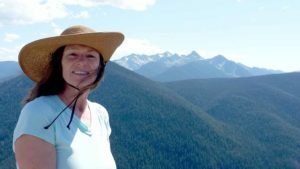 Now she’s focused on the saga of the Pacific Crest Trail hikers — whose numbers have exploded thanks to social media as much as the 2012 book and 2014 film, she says. This interview was conducted in early September. Times of San Diego: How many PCT hikers have you helped? How so? Did they stay with you? Ever consider hiking PCT yourself? Or part of it? I don’t have any plans to do any long distance hiking, although I once did Mount Whitney. I wouldn’t enjoy dealing with an ice ax at high altitude, going for days without a shower or camping alone in bear and mountain lion country. Plus, the blisters those hikers get on the PCT are not to be under estimated. But I must say, the scenery is awesome. How did you decide to make the car trip? Who or what inspired you to undertake this adventure? Then it hit me. If I was wondering where all these hikers go, other people must be wondering too. I knew I had a great story because of the increased interest in the PCT, and I knew I had to hurry up and do it. I left town 10 days later, after finding someone to move into my place. I didn’t have anyone I could leave my cat with, so I took her with me. I had been doing advertising trades with businesses for more than a year so I thought I’d do that along the way. I aimed for Canada, but I thought I could always turn back if it didn’t work out. Funds from my longtime advertisers already on my magazine also paid some of my other bills. How close to the actual PCT route did you get? What major roads did you take? I was often right by the PCT. For example, I was at Crater Lake and Mount Ashland. I encountered a hiker coming off the trail at Mount Ashland. I photographed at the trailhead at the back of Timberline Lodge at Mount Hood. I drove past trailhead signs on the North Shore of Big Bear, also just out of Chester, California, in Willamette National Forest north of Sisters and at E.C. Manning Provincial Park in British Columbia. I know it sounds incredible that I didn’t actually get on the PCT all that time. However, my story wasn’t about the PCT itself. Lots of people are writing about that. It was about the towns. I didn’t have time to go hiking and hope to find hikers. I wasn’t prepared for that, leaving on such short notice, and I had my cat in tow. Also, time was of the essence. I was fortunate to get to British Columbia with time to get my bearings and introduce myself to staff at Manning Park before the first hikers started coming through. As far as major roads, I took 395 in California and 97 in Oregon and Washington. Did you consider starting at southern point of PCT? I didn’t have time. There are some spots north and south of Idyllwild that I will pick up later in the season, after I interview the successful northbound thru-hikers. How many people hiked the PCT before the movie? How many hike it now — on an annual basis? Has this become an economic boon to Idyllwild? The book came out in 2012 and the movie in 2014. Long distance permits for 500 or more miles were issued to 4,453 people last year. This compares with 2,655 in 2014. The previous year, 1,879 people got the permits, according to the PCTA web site. The organization states that it doesn’t have reliable hiker permit numbers prior to 2013. It’s definitely an economic boon for Idyllwild to have hundreds of hikers, if not more, visit us, because hikers stay in the hotels and campgrounds and chow down at the restaurants and stock up on groceries and use the laundromat. To my knowledge, no one has ever calculated the exact revenue the hikers bring in. How are you and Cheryl Strayed alike? I think many women can relate to parts of her book. I didn’t do this trip because of the book, however. I didn’t start reading it until I got to Portland, Oregon and I’m still reading it. I didn’t see the movie until I’d been in British Columbia for a few weeks. What was your goal for the trip? I set out to describe the resupply towns on the PCT route and to get the inspiring stories of successful thru-hikers. Many are looking for something on the trail (new direction, self-discipline, themselves, God or simply nature). I wanted to see if they’d found what they were looking for, and I hoped to re-interview some of the hikers I talked to in Idyllwild. As people in the towns heard about my travel, they insisted that I include my own journey in the story, plus my cat. I was reluctant, but I eventually agreed. Now it is the story of a female journalist with a passion for this story, who was helped along the way by many wonderful people. Tell about the season’s first finisher of the hike, Sprocket. Sprocket (David Myers) is from Cornwall, England. He’s 31. He says he did it in 102 days. Dirt Monger (Ryan Silva, 39, of Glenwood, Colorado) was a couple of meters behind him, so they essentially finished together. (I don’t have his real name or other info yet). There’s great camaraderie on the PCT. Everyone is happy and encouraged to hear success stories. Most hikers take about five months. They’re all in touch on Facebook, so word spreads rapidly. One of the hoteliers I did a trade with was due for surgery within a few days. His extended family was gathered around him on the porch when I arrived. We all got chatting and realized we shared a belief in something bigger than ourselves. I wanted to be able to give something back. As I was leaving the next day, he was sitting alone on the porch looking sad and I asked if he’d like me to pray with him. “Would you?” he said, so delighted. “I hoped you would.” It was a very special bonding experience. That family is very generous and well loved by PCT hikers. Some people return years after their hike to see them. I can see why. Could other people use a barter system to make the trip — by car or foot? Did you ever go hungry on trip? I was offering something that was honored by businesses along the PCT resupply route. It wouldn’t be responsible of me to suggest anyone else should embark on such a trip because it did carry risk. It was a very stressful challenge, even though it was exciting and the scenery was stunning. What else did you do on trip? How did you connect with hikers? I spent time working on my laptop in cafes. I also stayed with some longtime friends in Oregon and Washington. My cat enjoyed meeting new people but wasn’t sure about the resident felines. At the hostel, at the end of the trail in Canada, someone referred me to his friend, a freelance director of photography for TV documentaries. That man hosted me for three weeks, while I worked and recuperated from the stress of the journey. We picked blackberries along the country roads and went canoeing and mountain biking. I’m grateful for his amazing hospitality and friendship. I encountered PCT thru-hikers at Mammoth Lakes Post Office, at the trailhead at Mount Ashland in Oregon and at trail angel Shrek’s place in Oregon. In several other locations, I also met section hikers, who are doing the PCT in parts over several seasons. In Canada, I met thru-hikers at the hostel at E.C. Manning Provincial Park, where the trail ends. I also did a lot of connecting via PCT Facebook groups. Staff at Manning Park let hikers know that I wanted to interview them, so some emailed me. Other women may look at your example and say: Not on your life. How did you assure your safety on the trip? I didn’t have any fear of anyone I encountered. There’s so much goodwill that surrounds the trail. I used my intuition. I never camped or parked in lonely places. I chose campgrounds where other people were staying. I had my car thoroughly checked before I left. I checked in with friends and my son, often. I kept quiet about my plans on social media and only talked about where I’d been, rather than where I was going. Did you keep you grown son informed during the trip? My son in San Diego liked the concept of my trip but was really worried about me being on the road without a lot of money and going into a foreign country. He was amazed and delighted each time I called to say everything was fine. After a while, he realized I was going to be OK. I grew in confidence, both personally and professionally. I had to face a lot of rejection as I asked numerous people to do advertising trades with me, so I learned to get over that. Some people hadn’t heard of the trail or Idyllwild and I still have some of my foreign accent, so it’s understandable that they weren’t interested in negotiating with me. That’s OK. I simply smiled and thanked them for their time. The people who trusted me were relying on their gut and looking in my eyes to see if I’m honest. I passed that test. Also, I now have a sense of accomplishment, linking the towns together as community. To my knowledge, no one has done that before. I hope it helps the towns’ economies. How would your book be different than other accounts? When do you expect a book to be published? My story is unique because of the way I funded it, which caused me to build relationships along the way. It’s a feel-good story of faith in something bigger than myself, which many of the hikers feel too. It refreshes people’s faith in humanity too, because of the way we all had to trust each other as strangers. I think my book will make great armchair travel for anyone, anywhere around the world, especially for women and cat lovers. Michelle the Cat is full of personality and won hearts along the way. Ken Stone worked with Pendray at the Union-Tribune and when she was editor of Ramona Patch, part of the AOL-owned network of hyperlocal news sites. Pendray’s stories are serialized on Specials Not on the Menu, her online magazine.